Power-Lift and Tumble drum corner-over-corner to mix drum contents. 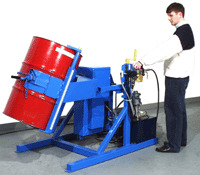 Rotate drum with vigorous corner-over-corner action. Save Time, Labor and Money! Mix in closed drum. 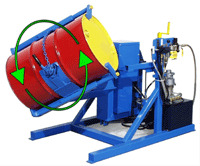 Enclosure with safety interlock automatically shuts of the drum tumbler when the door is opened. 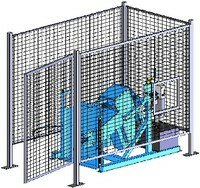 It has an opening to provide access to the RAISE and ROTATE controls.